iPads in the Library: Using Tablet Technology to Enhance Programs for All Ages. 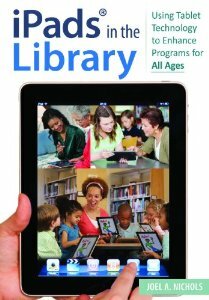 For librarians looking to integrate iPads and apps (also known as new media) into their library’s programming, there are no how-to guides. Most librarians getting started with iPads scour blog posts, presentations, and listserv comments, or rely on word of mouth for advice. Many librarians are forced to “reinvent the wheel” over and over again or decide to postpone their tablet-inclusive plans, not knowing where to start. With the publication of his recent book, iPads in the Library, Joel Nichols is filling the void. Nichols, manager of the Free Library of Philadelphia’s Techmobile, draws on his experience to effectively make the case for iPads and other tablets in the library, and he provides tested recipes for successful programs. Librarians looking to move beyond Nichols’ suggestions, however, may struggle to identify quality apps on their own as they expand their program offerings. The chapter on “App Selection Criteria” lacks detailed guidance on how to select apps beyond what’s offered in the program plans. As Nichols’ acknowledges reviewing apps in professional literature is “in its infancy,” so this reflects more the nature of ”apps in libraries” rather than his book. Unlike other media with long histories of evaluation by prestigious committees like the Newbery and Caldecott, for apps and new media there is little agreement on what makes a good app or book app, for program use or use anytime. As with other media, librarians need evaluation criteria that they can apply as they review apps and develop additional programming. iPads in the Library also includes only a limited list of current review sources, making the search for other program-appropriate apps daunting for some. Without an online element to the book that can be easily updated, readers will have to rely on their own research for other review sources as they come available. The other area not completely addressed in Nichols’ book is device management. While the chapter “Device Management Best Practices” does well to give specifics about using iTunes with several devices and setting up an umbrella iTunes account, librarians, especially those with limited IT staff or those proposing new iPad programs to supervisors or grantors, may have more questions about managing fleets of iPads. Information about how to manage multiple devices with Configurator or other software and how to purchase apps using the Apple Volume App Purchasing Program is not included. The publication of Nichols’ valuable how-to guide is a welcome addition to the librarian’s toolbox. It is written at a time when the new media landscape is rapidly evolving and librarians need resources like this one to get started. Because of the dynamic nature of new media and use of iPads, Nichols’ book will hopefully be the first of many resources for librarians using new media in the library. Posted on September 11, 2013, in Publishing and tagged book review, Claudia Haines. Bookmark the permalink. 1 Comment.